New item in original packaging. Nylon drawstring sports pack made of 210 Denier nylon construction. 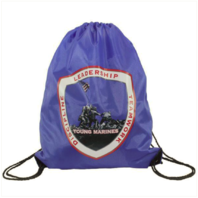 Blue Bag with Red, White and Blue Young Marines Shield logo.